Eugene Saunders, driver of the car, of Reynolds; jaw broken and right eye crushed, believed to be fatally injured. Taken to Americus hospital. Daniel Payne, of Reynolds, severely bruised. Miss Bessie Rogers, of Oglethorpe, bruised. Miss Imogene Anthony, of Reynolds, bruised. Four of the young people left Reynolds yesterday afternoon at 1 o'clock to attend a baseball game at Americus, between the Montezuma and Dawson teams. They stopped at Oglethorpe and picked up Miss Rogers. They didn't attend the ball game as planned. They left Americus shortly after 6 o'clock this evening on their return home. According to eye witnesses of the accident the car was making terrific speed as it approached Andersonville. The machine was going down a hill, at the bottom of which was a bridge. The auto struck a sand bed, however, before it reached the bridge and the car turned completely over. Miss McDaniel was thrown clear of the car and Saunders was pinioned under the frame. The other occupants were hurled some distance from the machine and the young women in the party stunned. Mr. Payne recovered from the shock and hastened to the overturned car, lifting the machine off Saunders. His act undoubtedly prolonged, possibly saved, the life of Saunders. Saunders was taken to the hospital at Americus where at a late hour tonight doctors began an operation in hope of saving his life. His condition was considered critical. Miss McDaniel was the daughter of Minnie McDaniel, prominently known at Reynolds. All of the young people belong to prominent families." 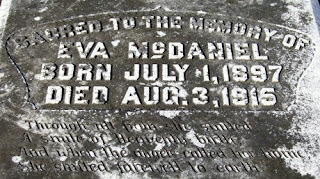 REYNOLDS, Aug 5 -- The funeral of Miss Eva McDaniel, a victim of the serious automobile accident at Andersonville Tuesday evening, when a heavy car driven by Eugene Saunders overturned as it descended a hill at high speed, was held here this afternoon. Rev. Z. T. Weaver, of Perry, conducted the services, and afterwards the body was interred in the Reynolds cemetery. Messages at noon today from the bedside of Mr. Saunders, who lies in a hospital at Americus with both jawbones crushed, are to the effect that he is doing as nicely as possible. His youth is in his favor, physicians say. Miss Imogene Anthony, another of the party in the wrecked car, is suffering from internal injuries, and her condition, while not critical, is considered serious." She smiled farewell to earth. Thanks for adding the research from the newspaper articles. It is very interesting. Without the articles, you might have thought she had died from an illness. Even in 1915, automobile accidents occurred because of speed. You are so right, Janet! While at the cemetery, I was thinking she had an illness, possibly life-long. I was actually surprised when I found the news article... You're right about cars and speed, too.